Last year the Musketeers had their most successful season in program history, as they won the Big East regular season outright and earned a number one seed in the NCAA Tournament. The Musketeers started the season 12-1, losing one game to Arizona State and beating in-city rival Cincinnati at home. The Musketeers started Big East play 3-2, losing games at Providence and Villanova. The Musketeers then reeled off nine straight wins to take the lead in the Big East standings, this streak included thrilling wins at Creighton, at Butler and home against Georgetown, where they either went to Overtime to win or in Creighton’s case they won on a controversial call. The Musketeers then played a home game against Villanova where they could have closed out the Big East title but they lost 95-79 to end their streak. The Musketeers then won their next three games to close out the season, which won them the Big East outright, which marked the first time since conference realignment that a team besides Villanova won the Big East. The Musketeers looked to top off their regular season by winning the Big East Tournament but they lost 75-72 to Providence in the Big East semifinals. Still, the Musketeers entered the NCAA Tournament as a one seed for the first time in program history. The Musketeers beat Texas Southern in the first round and they looked like they were going to beat Florida State in the second round but the Seminoles rallied to win and pull off the upset against the Musketeers. The Musketeers were led in scoring by Trevon Bluiett, who scored 19.3 points per game, while JP Macura and Kerem Kanter both scored in double figures. Chris Mack won Big East Coach of the year in his final season as the head coach of Xavier. The Musketeers have a tough schedule this season, as they will play in the Maui Invitational, at Missouri, at Cincinnati, and at home against Wisconsin, before playing in the Big East schedule. The Musketeers play a couple of buy games before playing Wisconsin at home, then heading to Maui for the Maui Invitational. This year’s Maui Invitational field is absolutely stacked, so if they go 1-2 in the tournament it is not going to hurt them. The Musketeers return and will play a few buy games before playing at Cincinnati on December 8th. The Musketeers will also play at Missouri before they open Big East play on December 29th when they play at DePaul. The Big East schedule works to where they will play each team twice in conference play. They’ll play Villanova on February 24th and they’ll close the season March 9th against St. John’s. The Big East Tournament runs March 13th-16th and the NCAA Tournament is the week after should they make it. The Musketeers lose a lot starting with their coach, Chris Mack who went to Louisville, leaving former assistant coach Travis Steele as the head coach. 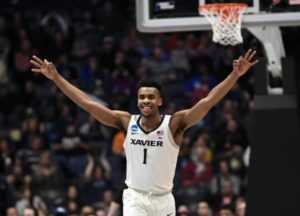 Trevon Bluiett is an all-time Xavier Musketeer, who graduates after having one of the best careers in program history. Kerem Kanter and JP Macura were both double-digit scorers, who graduated. Sean O’Mara also graduated, while Kaiser Gates decided to play overseas. All those departures leave a basically new roster for the Musketeers, which will have new leadership in place. Quentin Goodin will probably be the best player on the team, based on his ability to both pass and score. Naji Marshall should get more shots and he could become the leading scorer on the Musketeers. Tyrique Jones should be a good role big guy for the Musketeers, being good both offensively and defensively. Paul Scruggs should take a step forward in year two at Xavier, becoming more of a playmaker. Zach Hankins will probably start at the center because of his height, experience, and ability to play inside. Keonte Kennedy and Dontarius James will look to help out a freshman this season, while Kyle Castlin and Elias Harden will look to help out as role players. Overall this roster is not as talented as it has been in years past but it still has the pieces around it to make it a tournament team. This team should struggle out of the gate but I think as the season goes along the Musketeers should become a decent team in the Big East. The Musketeers should win their first two games before I think they will have a tough matchup against Wisconsin, they then head to Maui to play in the loaded Maui Invitational, if they can make it out of those first six games going 4-2 or better that will set them up going forward. The Musketeers should stack up a few more wins before playing at Cincinnati on December 8th. The Musketeers should probably be around 10-3 entering conference play, which would definitely set them up going forward. In Big East play the Musketeers probably will be a bit streaky but I think they should end the Big East schedule being around 9-9 in conference play, which should get them into the NCAA Tournament. Xavier has surprised many in the tournament before, so don’t be surprised if this team makes a surprise run to the Sweet 16 this season. Overall this team should be a middle of the road type team in year one under Travis Steele, which will set them up going forward.